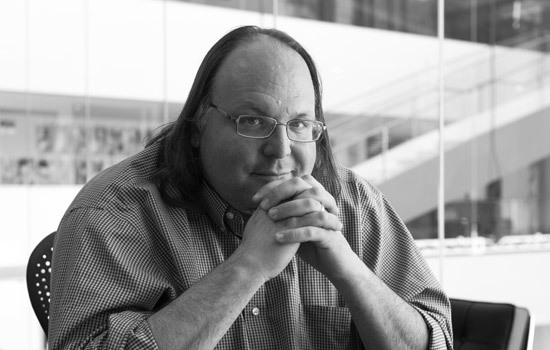 Ethan Zuckerman, director of the Center for Civic Media at MIT and co-founder of the blogging community Global Voices, is the next speak erfor RIT's lecture series “Where Text and Code Collide: The Digital Humanities Speaker Series” on Nov. 11. For years, Ethan Zuckerman has analyzed how the world uses new media to share information across cultures, languages and platforms. He’ll share what he’s learned with the RIT community as the next speaker for “Where Text and Code Collide: Digital Humanities Distinguished Speaker Series,” 8 p.m. Nov. 11 in the Chester F. Carlson Center for Imaging Science auditorium, Rochester Institute of Technology. Zuckerman will be joined by RIT graduate student and researcher Erhardt Graeff and will sign copies of his latest book, Rewire: Digital Cosmopolitans in the Age of Connection, immediately following the presentation. Zuckerman, director of the Center for Civic Media at MIT and co-founder of international blogging community Global Voices, will discuss the relationships between contemporary societies and their media, our new abilities to collect and analyze data about media production and consumption around the world, and how digital media can enable activities and other civic actors to organize and push for change in new ways. An advocate for Internet freedom and international civic engagement through digital media, Zuckerman was named by Foreign Policy magazine to its 2011 list of top global thinkers. The presentation—free and open to the public—is sponsored by the RIT Project for the Digital Humanities, College of Liberal Arts and the Gannett Endowment for the Humanities, with the cooperation of RIT’s MAGIC Center. For more information, go to rit.edu/cla/speakerseries.php.